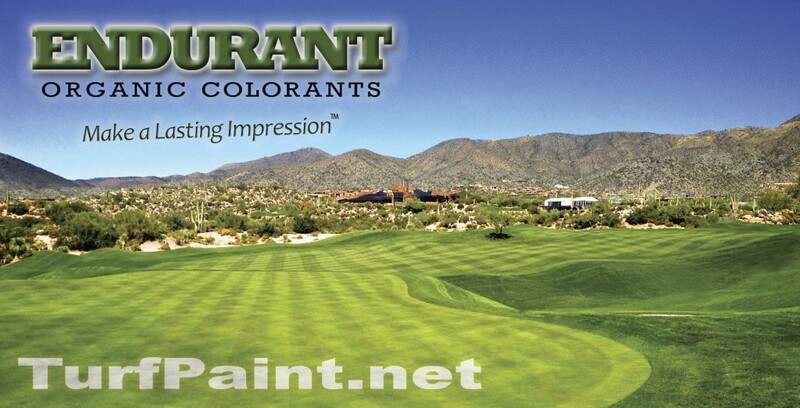 Endurant is the professional’s choice in turf colorant. This guide offers tips on how to paint turf using Endurant turf colorant on a golf course, football field, sod farm, lawn or other area of turfgrass. So by now you know why to paint turf with Endurant turf colorants and below we share how to paint turf. Lawns, golf courses, football fields, baseball fields, horse race tracks, sod farms– these are some of the places Endurant is keeping grass green. Endurant is saving professionals’ money and replacing the practices of over-seeding, over-watering, over-fertilizing and over-spending with an eco-friendly alternative. Endurant turf colorants come in a variety of shades, concentrations and formulations to match the most popular turfgrass species. Paint turf with a colorant that complements the natural color of the turf. When selecting the shade of Endurant remember that chlorophyl in the grass blades add to the color depth when combined with Endurant. If the turf goes into dormancy, remember the loss of chlorophyll can lead to an apparent loss of color depth. These can be subtle, but helpful to keep in mind when selecting from the various available concentrations and color depths described below . Endurant TE is formulated for actively growing grass and is often used during spring green up and can be used throughout the seasons while turfgrass is growing. Endurant TE maintains even, gorgeous turf color during overseed once the seed begins to germinate or sprout. Endurant TE mixes well with other products for ease in application. Endurant TC is the original colorant and provides a natural shade of green grass. Endurant FW is the fairway formulation with a shade of hunter green similar to actively growing Bermudagrass; Endurant PR offers a brighter green of perennial rye grass color and Endurant Premium is utlra-concentrated deep, rich green color. All Endurant colorants are available in very high concentrations providing various shades of green to best match your needs, aesthetic desires and turfgrass variety. Buy here or contact Geoponics for larger quantities, 1-877-ECO-GROW. Buy Endurant here or contact Geoponics, 877-ECO-GROW, for larger quantities. Avoid painting when it is windy or when rain, snow or other precipitation is forecasted within 8 hours. Consider applying during a morning dew or frost for great coverage. Though it is not necessary that dew or frost be present on the grass blades, it can actually help. Remove objects and debris from the turf to clear the surface to be painted. Mow, maintaining a turf height of 1-inch if possible. Lower, dense turf colors best. Pump pressure should be in the range of 40-60 PSI. A dual cradle with .008 or .006 nozzles is preferable. A 110″ nozzle angle with 20″ spacing is adequate, but 10″ spacing will cover best if not spraying in two directions. Do spray in two-directions for best even coverage and to eliminate streaking if no using 10″ spacing. Adjust the height of the boom between 12-20″ above the turf. Centrifugal pumps may require an oil seal replacement from ceramic to steel (NAPA seal). Remember to stir the colorant prior to mixing. Endurant TE is commonly used at a rate ranging from 16 to 32 ounces per acre, depending on desired color depth and other considerations. Endurant FW and Endurant PR are commonaly applied at rates ranging from 3 to 8 gallons per acre, depending on desired depth of color, current turf color and other conditions. A 15:1 water to color ratio or less should be maintained. Recirculate or constantly stir the colorant mix if possible. Read labels for more tips on application rates. Hear other professionals share tips on how to paint turf and why to paint turf with Endurant turf colorants. Read this blog with comments from professionals in the field who have used Endurant for many years.